At La Porte High School, for example, art students turned an old birdbath into a beautiful work of art that provides a colorful complement to the LPHS Memorial Garden. 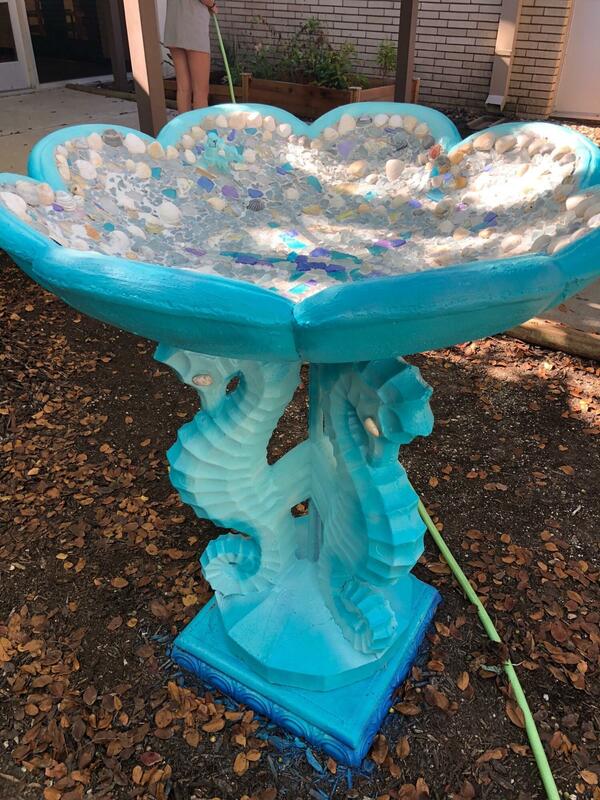 Mary Gagneux, LPHS art teacher and Art Club sponsor, explained that Tiffiny Vaughn, Interact Club sponsor, approached her about making the birdbath a creative project of the group. Vaughn suggested a beach theme for the project, in keeping with the school’s proximity just a stone’s throw away from Sylvan Beach and Galveston Bay. Over the past few months, the Interact Club has led the effort to revitalize the Memorial Garden at the school, working on Saturdays to clean out debris, frame the garden with timbers, rake leaves and trim shrubbery. One day this spring, they were joined by members of the National Honor Society, HABLA and Student Council to distribute four truckloads of mulch from the City of La Porte. In recognition of their efforts, the club earned “Service Project of the Year” at the Interact District Conference. The art students drew sketches of the design for a mosaic starfish and then used three shades of blue paint to fade color onto the base of the fountain. 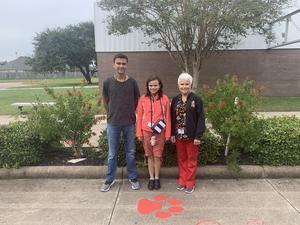 Another example is at Lomax Junior High School, where nurse Sheila Knittle has led after-school efforts to beautify the flower beds at the front of the campus for the past several years with the assistance of a La Porte Education Foundation grant. Nurse Knittle and her students landscaped the entrance as well as the courtyard at Lomax Junior High, with students about the different types of plants and the steps in maintaining a garden. In addition, James H. Baker Sixth Grade Campus teacher Amy Lashley recently led the effort to revitalize a flower bed at the campus. Students and their parents worked with the Baker staff to turn the area into a butterfly garden for their use in science class. Danette Tilley, executive director of secondary education, explained that these are just a few examples of how La Porte ISD students are demonstrating their pride in their school and community by getting involved in outdoor projects at their campuses. She expressed appreciation to Gagneux, Vaughn, Knittle and Lashley for their leadership in these efforts as well as the many others who helped to complete the projects. Top Photo: Lomax Junior High School nurse Sheila Knittle, right, and students Garret Salinas and Gabby Salinas, show off the garden at the entrance of the campus that was landscaped by students. Knittle submitted a grant proposal to the La Porte Education Foundation for the project. 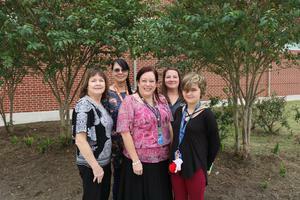 Middle Photo: James H. Baker Sixth Grade Campus representatives are proud of the new butterfly garden at the campus. Staff members, students and parents worked together on the project on a recent Saturday. 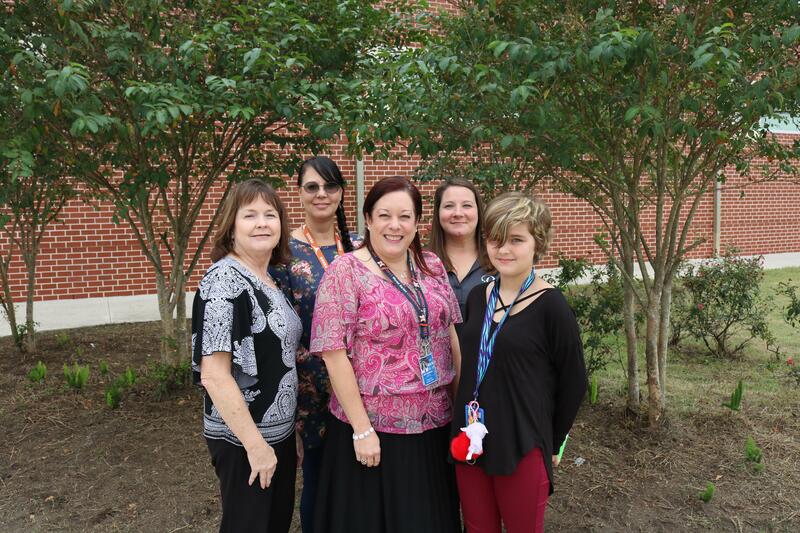 In front from left are Lynda Williams, attendance clerk; Dr. Alicia Upchurch, principal; and Emily Giesler, student; and in back are Lyda Paz-Rodriguez, principal’s secretary; and Amy Lashley, science teacher, who led the project.